"Expenses for donating an organ for human transplant." As opposed to what? I know we put pig parts in people, but have we started putting people parts in pigs? Is this one of of those weird things the government has to throw into a document somewhere so it's not technically a secret that we're conducting crazy genetic tests somewhere? Have we actually captured Osama Bin Laden and transplanted his brain into, like, a parakeet or something? Surprisingly, that's not the weirdest. Really? Nazis? Are there really still cases being settled over Nazi cases? 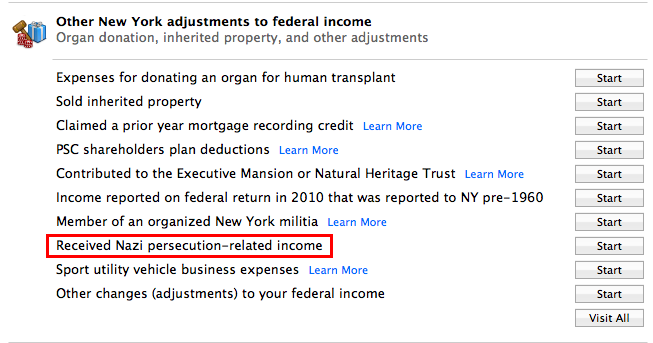 I mean I saw that Law & Order episode where a bank was convicted of taking money from Jews they knew were gonna die so they wouldn't have to pay death benefits, but I feel like this isn't necessarily common enough to pop up in Turbo Tax. Hell, maybe Turbo Tax just really, really hates racists and wants to remind us. It's accounting software. I'm sure a Jew must have worked on it somewhere along the line.